Netflix App on 3DS: It Really Works! 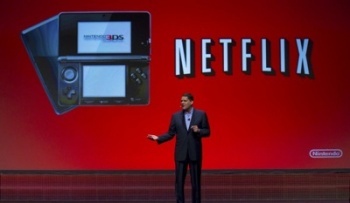 After intense testing at The Escapist Magazine bunker, the Netflix application for Nintendo's new handheld gets five stars. Today, Nintendo released an update for its 3D handheld system that included the ability to download a free application from Netflix. The app lets you hook your Netflix account to your 3DS, and, if you have unlimited streaming enabled, you'll be able to watch any movie or TV show that is in the Watch Instantly library on your handheld (not-just) gaming device. With a wireless internet connection, a comfortable chair, and a sandwich, you'll be able to watch movies on your 3DS without being tethered to a power cable. Setting the app up thankfully doesn't take too long. First, you have to download the update from Nintendo, which proved the most difficult part of the process because the option is buried in the Settings tab. Once that's done, you have to go into the Nintendo eShop to download the Netflix app. Open that up, and you are prompted to enter some location information and finally given a code. Take that code to an internet browser on another device to access your Netflix account, and once you enter it in the 3DS should link itself up nicely. The upside here is that you don't have to constantly enter your username and password each time to log in but the downside is that it's a little tough to switch Netflix accounts - which is only important if you share the 3DS amongst, say, an office full of game journalists. But that task can still can be achieved by deactivating all devices from your Netflix account from the web page, shutting down your 3DS and then restarting the app. You'll be prompted to enter another unique code on the web to reconnect the device to an account, but at least you won't get slapped upside the head for filling your boss's Instant Queue with Conan the Destroyer and Enemy Mine. The picture is great quality - for such a small screen. Older TV shows like the British Office looked about as good as you can imagine, but even special effects-laden blockbusters like the 2009 Star Trek revamp were rendered fantastically. I was a bit disappointed that I had to watch that film in letterbox, with two black bars on the top and bottom, but it didn't matter when I was staring longingly at that green chick's backside. Keep in mind, the 3DS must be connected to a wireless internet connection for the app to work, but if you are bored at your Aunt Sheila's house and the router you helped set up for her is just collecting dust, there's no reason you can't kick back and catch up on Doctor Who episodes. The user interface for the application looks similar to what you see when you access Netflix on the Xbox 360 or PS3, except that the menu options are rendered in 3D on the top screen. I found the menus popping out at you a nice touch, but they can always be turned down or off with the 3D slider. Another neat thing - when you want to zoom through a scene by fast forwarding, the frames pop across the screen on a different layer than the film beneath. The effect isn't quite Minority Report, but it was cool nonetheless. The big question for everyone was whether watching movies was going eat up the much-maligned battery life of the 3DS system. Well, I can definitively say that such concerns were completely unfounded. I played through the entirety of the aforementioned Star Trek (all 2 hours 4 minutes of it plus credits) and the battery indicator is sitting at 3/4 full. With that kind of performance, it looks like watching movies through the Netflix app squeezes even more battery life from the device than just playing games. The additional feature of being able to play movies anywhere you take your 3DS came just in time for me. I'm heading out for a week to visit my wife's family in Florida soon - so you know that I'll get more than money's worth watching whatever I can on my tiny screen just so I don't have to socialize with Aunt Sheila. Thanks Nintendo and Netflix for not making me talk to my inlaws!